“March of the Penguins” for Silver Explorer guests at Salisbury Plain, South Georgia, in November. Courtesy of Silversea Expeditions. If you’ve not seen the documentary, check out the trailer here. The smallest penguin species is the appropriately named Little Blue Penguin (also called the Fairy Penguin), which is only slightly taller than a Barbie doll, at 16 inches (40 centimeters) in height and weighing only a little more than 2 pounds (1 kilogram). On the other hand, I was surprised and somewhat alarmed to learn that some prehistoric penguins could be as tall as and as heavy as humans. Some 30 million to 40 million years ago, Nordenskjoed’s Giant Penguin grew to nearly 6-feet (1.80 meters). Can you imagine confronting a penguin of such proportions? Well, don’t worry. You won’t. They disappeared as fish-eating whales outperformed them in a life-or-death competition for food. 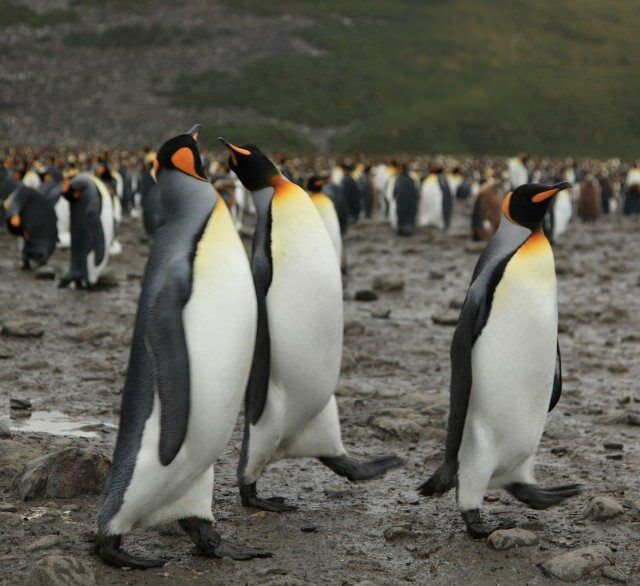 Only about half the size of its prehistoric predecessors, King Penguins in South Georgia. Photo courtesy Wikipedia. Today, there are somewhere between 17 and 20 living species of penguins, depending on which authority is followed. They are fascinating birds. Though their wings are useless for flight, penguins are agile swimmers. That’s because the penguin’s vestigial wings have evolved into flippers. Using those flippers, penguins can swim at remarkable speeds, up to 17 miles per hour (27 kilometers per hour), and some species can dive deep. Emperor Penguins, for example, have reached depths of 1,870 feet (565 meters) for up to 22 minutes. A thick layer of insulated feathers keeps the penguin warm in water. In the extreme Antarctic winter, penguins control their blood flow to their extremities, thus reducing the volume of blood exposed to cold while keeping their feet and wings from freezing. With temperatures that can dip to the most severe on the planet (the record was 128.6 °F /89.2 °C at the Soviet Vostok Station in Antarctica on July 20, 1983) penguins often huddle together to keep warm, and they rotate positions so that each penguin gets a turn in the center of the heat pack. One of the oddities about King Penguins — as well as Emperor Penguins and perhaps others — is that they do not make nests. Instead, they hold the eggs on their feet during the incubation period (this anomaly in the animal kingdom is depicted in the documentary “March of the Penguins.”) Newly hatched eggs are held on their parents’ feet for the first 30 days to 40 days. The process of shifting the egg from one parent to the other is a tedious exchange that can crack the egg, and end the life within it, if exposed to the ice and cold for too long. On the excellent website, penguins.cl, operated by the International Penguin Conservation Working Group, I learned that the Aptenodytes Patagonicus (otherwise known in a more palatable vernacular as the King Penguin) no longer breeds in Patagonia, despite its name, Patagonicus. In fact, throughout all of South America, the colony was wiped out by sealers during the 19th century. Penguins.cl notes that King Penguins can live more than 30 years in captivity but fails to note the average lifespan in the wild. However, penguins have no land predators in Antarctica, only sharks, orcas and leopard seals in the sea. The website notes that King Penguins feed primarily on small bioluminous Lanternfish — and occasionally, squid — which frequently exposes penguins to the sea and the dangers that lurk beneath. I’m not certain when penguins.cl was last updated, but at the time the page on King Penguins was published, the breeding population was a scant 400 pairs on the Falkland Islands, with the majority of the 2 million breeding pairs found on the islands of South Georgia, Crozet, Prince Edward, Kerguelen, Macquarie and Heard, all close to the Antarctic Convergence, the curve that continuously encircles Antarctica where cold, northward-flowing Antarctic waters meet the relatively warmer waters of the subantarctic. The King Penguin is the world’s second largest, weighing from 26 pounds to 30 pounds (12 kilograms to 14 kilograms) and standing close to three feet (90 centimeters), only half the size of the aforementioned Nordenskjoed’s Giant Penguin. I owe a debt of gratitude to Mike Bingham for the information on penguins.cl. 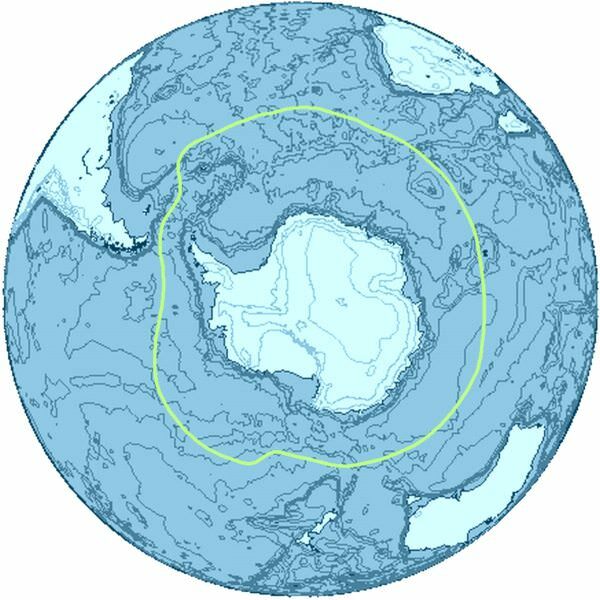 The Antarctic Convergence. Courtesy Wikipedia. The penguins in the photo at the top of this post are King Penguins, photographed in Antarctica during a November voyage on Silver Explorer, the vessel I will be sailing on in December. 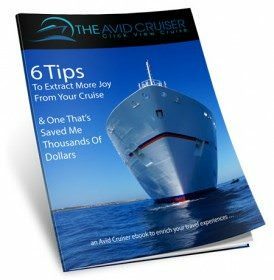 In fact, Silversea Expeditions runs an excellent blog, which is where I sourced the photograph. 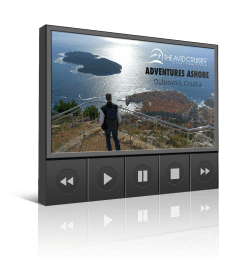 Ralph: On your expedition on Silver Explorer you are likely to see only Adelies and Chinstraps, and possibly some Gentoos. 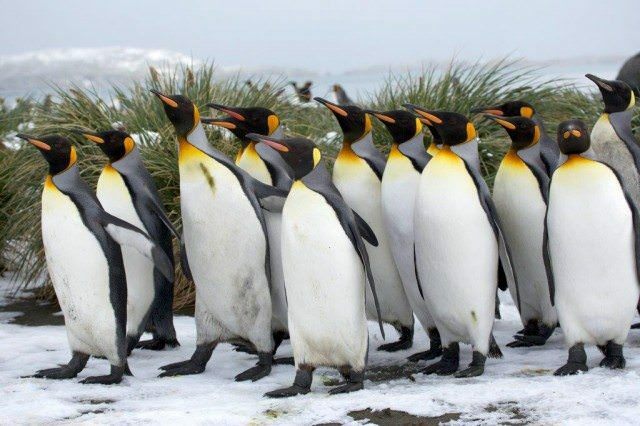 Sadly for you, there are no Emperors on the Antarctic Peninsular, and Kings breed only on ice-free ground such as South Georgia and the Falklands. 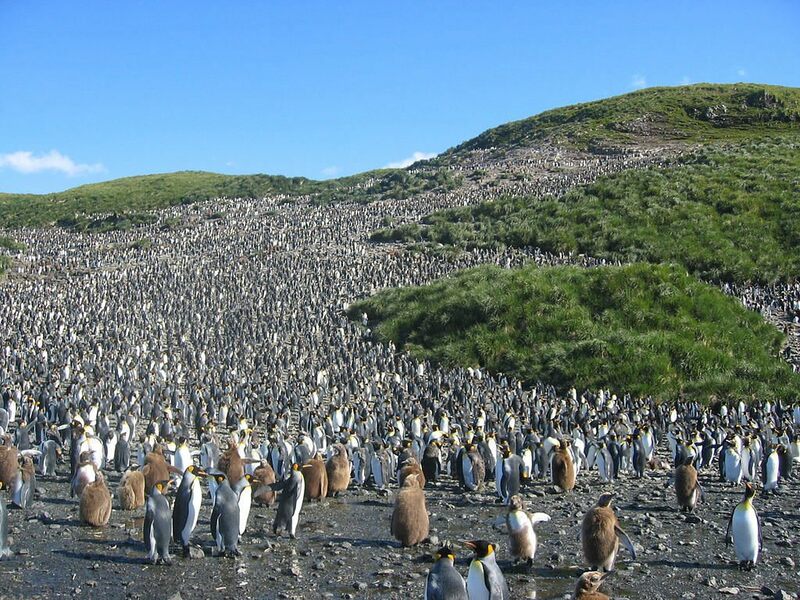 I agree with your query about the King population of the Falklands: when I was there earlier this year I am sure I saw almost 400 pairs in one location. Pray for a tranquil crossing of the Drake Passage, with no repeat of last season’s freak wave that severely damaged Silver Explorer down there. Thank you Felipe. You’ve enlightened me about which penguins to expect. I read about last year’s crossing, and I am hoping for the best. I do have to say that it seemed the crew performed admirably in the situation. Nature can sure be unpredictable, especially there it seems. Thanks again.